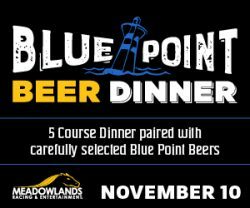 East Rutherford, NJ … This Saturday (Nov. 10) Meadowlands Racing & Entertainment is hosting a five-course beer dinner featuring Long Island’s Blue Point Brewing Company. The dinner is $49.95 with each course expertly paired by Executive Chef Dennis Sammarone to showcase Blue Point’s brews. Beer dinner guests also get a show on the racetrack with live harness racing kicking off at 7:15pm.